Replace drab poster board signs or concierge desks with Peerless-AV’s sleek digital signage kiosk. 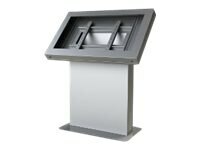 Designed to best support an ultra-thin display, this kiosk is sure to make an impact with your audience. Ideal for a hotel lobby, corporate campus, hospital, shopping mall, college campus and more, this kiosk is the perfect solution for digital advertising, wayfinding, interactive content and much more. Stand-alone kiosk enclosure or fully integrated with display, media player, power and thermal management, etc.